A analysis by the San Diego County Taxpayers Association released Thursday concludes the SoccerCity initiative proposed for the Mission Valley stadium site would net the city more tax revenue than the competing SDSU West proposal. SoccerCity would add $4 million to the city’s general fund each year, while the SDSU West plan would add $1.9 million annually, according to the association. Currently, the city loses millions of dollars per year operating the former Qualcomm Stadium. The association based its data on sales, hotel, property and possessory interest taxes. Both initiatives appear headed to the Nov. 6 ballot after two San Diego Superior Court judges ruled on Wednesday against City Attorney Mara Elliott’s contention that they interfere with the city’s ability to manage its finances, land use and planning. Whichever measure receives the most votes — assuming it exceeds 50 percent — will win the rights to negotiate with the city to redevelop the Mission Valley site, barring future legal challenges. Haney Hong, president and CEO of the Taxpayers Association, said his group’s analysis is “vital” to understanding pertinent facts heading into November. “Our report will be a resource to voters as they make a decision that will affect so many future generations of San Diegans,” he said. 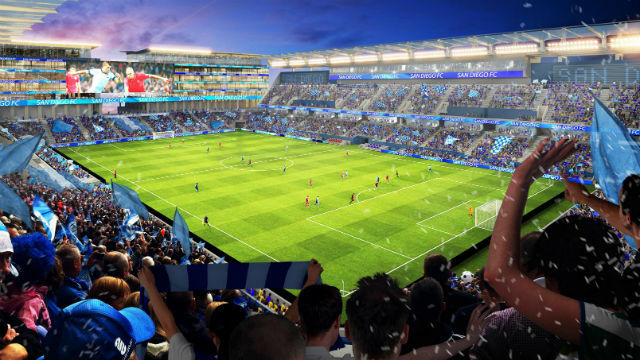 The SoccerCity initiative also proposes mixed-use spaces, as well as a 23,500-seat professional soccer stadium that could be expanded to accommodate Aztecs football. The Taxpayers Association has spent seven decades analyzing public policy. Thursday’s analysis is the final section of a nearly 200-page report released incrementally over the past several months. The full report can be found at sdcta.org.